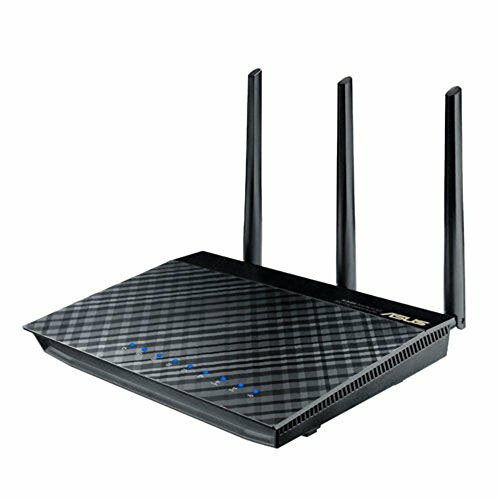 The ASUS RT-AC66U Dual-Band Wireless-AC1750 Gigabit Router is the newest of its class to hit the market. Read on our Asus rt-ac66u review to find out why! It’s one of the latest to support the new 802.11ac Wi-Fi standard. It is one of the slightly more expensive routers out there but it is worth it because it's a good gaming router. Our ASUS RT-AC66U review will present you why this router is at the top of its class. The router serves many other purposes than just the fast internet speed. It has twin USB ports that can connect to file, DLNA, and printer servers. The router technology amplifies transmissions to provide a larger range of coverage than any other router out there. The wide range of applications make this router good for businesses, but it is more convenient to have in your home. The router’s latest update, version 3.0.0.4.246, brings its latest firmware on board. The previous firmware had problems that were later fixed. The update contains a new cloud-based storage system for anyone wishing to access their storage remotely. The RT-AC66U has a sleek casing that fits almost anywhere. It has detachable external antennas that stick up from its back. The router can pretty much be placed anywhere, even in a vertical position if it needs to be. Overall, the router looks heavy duty and will gain the respect of your friends. The router has four LAN ports and one WAN port to connect to an internet source. These ports are all Gigabit Ethernet, and therefore, provide very fast internet. The router comes with a CD of software that walks you through every step of installing the router, so you should have relative ease when trying to get it hooked up. If you are familiar with routers you do not have to use the CD to install it. The router has a web interface that is easy to use. Through the web interface, you can add guest networks, rerun the initial set-up wizard (if you ever have to reset your router). The interface has a general items section. This section offers a Network Map where you can view your devices currently connected to the internet. From the Network Map, you can block a device or set-up a network storage system for that device by clicking on the device from the map. Sometimes there can be a lag when registering items. The general items section also has a parental control feature, a traffic manager, and a way to manage the router’s USB ports. There is also a section for advanced settings on the web interface for anyone who is tech-savvy enough to customize these settings. In the advanced settings, for example, you can create a virtual private network for remote users. This would be great for accessing private files that in a security-sensitive company. Lacks true Cloud platform of D-Link/Linksys. The router possesses a 2.4GHz/5GHz band that drives data rates 1.75Gbps. This is fast compared to other similar routers on the market, even ones also operating with the new 802.11ac Wi-Fi standard. The two USB ports that I mentioned were located on the back of the router have many functions. They have been used to connect to external data, printers, and a USB dongle that will turn the router into a mobile hotspot. If you connect an external hard drive to the router, you can perform PC-less downloads. Another unique feature of this router is the Wi-Fi Protected Setup button, which starts a two-minute window to allow other people to enter the wireless network (with your permission). The Asus RT-AC66U Router comes packed with many things including a support CD containing a user manual in PDF format and driver software, tree external antennas, an Ethernet cable, a power adapter, a small quick start guide booklet and the router. The RT-AC66U, first of all, has a static IP routing protocol, it offers an abundance of features including ASUS AiRadar, MAC address filtering, P2P client, network monitoring, parental control and many more. It uses an external power adapter that requires the following voltage AC 120/230 V and frequency (50/60 Hz). It has three external detachable antennas, 256 MB of RAM and runs with all the best known operating systems. Overall, this router offers insanely great performance and can have many applications. It will serve brilliantly as a multi-purpose machine in your office or as an insanely fast device for your gaming needs. And that's it, we hope you liked our Asus rt-ac66u review and if you're interested click the link below. If you have any questions or would like to see another review for a specific product feel free to send a message by referring to the contact page.